Over the last seven or eight years, I have been drawn to reading biographies of some of history’s greatest men (apologies to history’s greatest women – I just have a harder time relating). I’ve read Doris Kearns Goodwin’s biography of Abraham Lincoln, Team of Rivals, Eric Metaxas’s biography of William Wilberforce, Amazing Grace, his biography of Dietrich Bonhoeffer, and I just finished John M. Barry’s Roger Williams and the Creation of the American Soul: Church, State, and the Birth of Liberty. Even a little farther afield, I read Unbroken a few years ago, which – if you haven’t heard by now – is the inspiring story of Louis Zamperini who, after a short career as an Olympic runner, suffered one of the most harrowing and grueling journeys after his plane crashed in the middle of the Pacific Ocean during World War II. And I could perhaps also add that I’ve gathered a few gems while reading a recent biography of E. J. Waggoner. I read biographies for inspiration. I read them to glean insight on what makes great men great. Because, the truth is, I make it no secret: I aspire to greatness and want to change the world insofar as it can bring glory to God and help hasten His return – recognizing, of course, that I am falling infinitely short of this goal (if my wife and kids won’t confirm my failings for you, certainly the churches I pastor could). As I’ve gone through these biographies, though, I’ve noticed that these great men seemed to all share a number of common characteristics that made them great. I could list many. But through it all, I’ve noticed one characteristic in particular that seems fairly ubiquitous, standing out above the rest. I’m probably late to the party, and it may not be all that profound to you, but this characteristic has stuck out to me quite poignantly. It is simply this: all these great men were willing – no, eager – to relentlessly pursue their convictions even at the risk of great personal loss, some of them even death. They had convictions, of course. We all do. But what separates a person who is merely a historical footnote and those who are memorialized – and here we could add people like Martin Luther and Martin Luther King, Jr. and Nelson Mandela, and of course Moses, Elijah, Paul, and Jesus – is that the latter were willing to not only do something about their convictions, but follow them to the point of personal loss. Their convictions weren’t merely armchair convictions. They didn’t follow them when it was only convenient, trendy, or popular. They were sold-out and devoted to them, and would not waiver from passionately pursuing them. Indeed, the refused to play it safe. A life of ease and comfort was not an option for them so long as their convictions remained unfulfilled. In short, they all exercised unparalleled courage – starting, of course, with an absolute disdain for the status quo, followed by an equal obsession with ferociously pursuing change. The experience of Roger Williams is, of course, fresh in my mind. After arriving in the New World in 1631 and immediately being courted to become the pastor of the church in Boston – the New World’s most prestigious pastorate – which he declined, he was soon banished from Massachusetts for promoting what he would later call “soul liberty,” i.e., a person’s right to freely follow his or her conscience in matters of worship and faith. Such an idea was extremely radical for his time – and Massachusetts, believing they were in covenant with God to stand as the “city on a hill” that showed the whole world what a Christian nation looked like, would have nothing of it. They at first decided to send him back to England, but when they issued him a summons, Williams sensed that his life was actually in danger and, leaving his wife and kids in Salem, escaped into the Massachusetts wilderness. For the next fourteen weeks, during the harsh winter, he was sustained by the care and kindness of Native Americans. Life didn’t get a whole lot easier for him, however, when he emerged in the land south of Massachusetts and ultimately started Providence Plantation and what would later become the state of Rhode Island. For the next two decades, the surrounding New England colonies pressured and harassed, sometimes violently so, Williams and those who took up residence within his borders – all because Williams and his colony promoted “soul liberty” and welcomed people of all stripes and persuasions. But even to the end, instead of surrendering his convictions, he chose poverty. 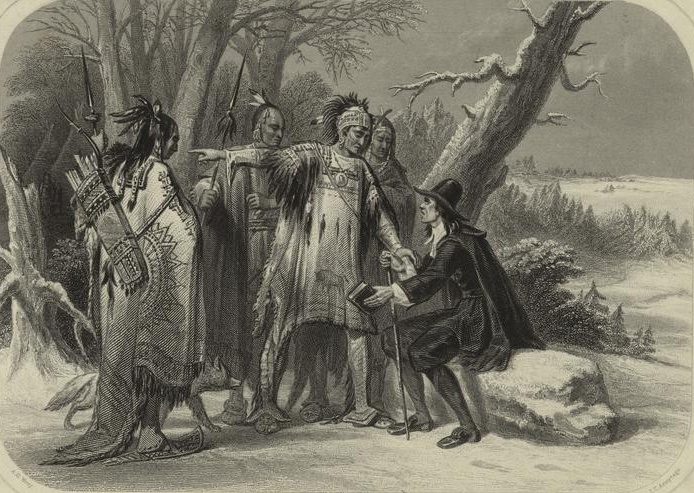 It’s no wonder that, of Roger Williams, John M. Barry writes: “Roger Williams never conformed – not even as a child, for even his father had persecuted him for his beliefs as a young boy. Yet for all his conviction, for all his commitment to his own way, it was not certainty he had clung to much of his life. . . . As he had told [John] Winthrop so many years before, I desire not to sleep in security and dream of a nest which no hand can reach” (p. 345). And such could be said of all of history’s great men. They didn’t stay on the sidelines, privately holding their convictions. They followed them to their logical conclusion, staring straight into the face of danger and putting it all on the line if that’s what it took. It deserves mentioning, however, that these men didn’t themselves go courting persecution for persecution’s sake. They didn’t intentionally look for trouble. Their goal was not simply to try to incite people. Their goal was to relentlessly pursue their convictions, come what may. Neither did they stand on the periphery of society as outsiders or outcasts, unable to gain an audience. They didn’t simply shoot arrows from the outside, trying to pick people or ideas off. They used tact and got into the trenches with people, trying to capitalize – for the sake of their ideals – on the relationships they had cultivated. Again, Barry writes of Williams that when he interacted with his foes from Massachusetts, he was “subtle, charming, gracious, and yet determined” (p. 369). All this inspires me with the idea that a life free from adversity and risk is not a life worth living. People who play it safe don’t make a difference. They may make a living, perhaps even make a name for themselves, but they don’t make much of an eternal difference. It somewhat reminds me of what C. S. Lewis wrote about tithes and offerings – which he called “charities.” “If our charities,” he wrote in Mere Christianity, “do not at all pinch or hamper us, I should say they are too small” (p. 86). And if our convictions and ideas don’t challenge and disquiet the status quo – and as long as we’re this side of heaven there will be a status quo to challenge – then perhaps they’re also too small. Indeed, people who merely flirt with ideas from ivory towers or quiet, idyllic pastorates, dispassionately and casually debating philosophical and theological minutiae, may tickle the intellect or the funny bone, but they don’t incite revolutions or revivals. And that, to me, is no existence at all. Whatever Happened to the Second Coming? This morning, as I was playing with my kids, I decided to ask the old “where do you want to live when you grow up?” question. Mind you, my kids are almost-six, four, and 13 months. I didn’t say it to be cute. I didn’t say it as a rote catechetic obligation. I said it because every part of my brain wants to mean it. And I said it because, as I added a few minutes later, we should want Jesus to return soon because He’s terribly sad right now not only about being apart from us, but also about all the pain and suffering that hurts Him on a deep emotional level as He witnesses the misery that continues to characterize this planet. And we argue about topics that may or may not have any bearing on whether Christ’s return happens sooner rather than later. But what happened to our prophetic urgency? What happened to the deep longing that the early apostles and the early Adventists felt that produced a yearning in their soul to see Jesus – and soon? Perhaps we’re too content pursuing the “American dream,” which has seemingly usurped the “Adventist dream” of living to see Jesus return – and doing all we can to increase the likelihood of that happening. Two caveats are in order, though. First, when I say that we don’t talk much about the Second Coming anymore, I’m not necessarily talking about the requisite sermons, books, or articles about the “signs of the times.” We seem to have plenty of those still. And they have, perhaps, been the reason why we have been jaded about talking more about the Second Coming. Secondly, what I am urging is not a sort of Christian or Adventist “escapism” where we think the whole goal of Christianity is simply for God to be able to get us off this lousy planet – which He’s going to burn up anyway. I don’t speak of the Second Coming as some type of alternative to caring for the planet or the people on it. What I’m talking about is the deep yearning of soul to be with Jesus – literally, in person. I’m not talking about trying to escape this world so that we can slide down giraffe’s necks. I’m not talking about trying to get out of this world as a way to ignore and escape the suffering all around us. Even more to the point, I’m talking about having a deep longing for His return for His sake. After all, if we understand Christianity as a relational experience, and we truly believe God is a relational Person, we would thus have to recognize that, as a relational Being, God longs to be with us. In fact, the cross demonstrates as much. If God was willing to give up His Son for the sake of our eternal life, doesn’t it stand to reason that He would want to retrieve the possession that He purchased with His Son’s blood as soon as He could? Despite our many attempts to rationalize away the delay in the Second Coming by pointing out that a day is as a thousand years to God, time does matter to Him. The yearning I feel to be reunited with my wife and kids when I am away from them merely for a weekend (as I was last weekend) is but a drop in the bucket compared to the yearning that God feels about being with us, in person. Similarly, as a relational Being, isn’t it clear that every time a child is hurt or a wife is abused God feels it on a deep emotional level? If we thus truly love God as much as we many times claim to, wouldn’t we thus want to do all we could to hasten His return as a way to bring an end to the pain that resides in His heart? Those who think of the result of hastening or hindering the gospel think of it in relation to themselves and to the world. Few think of its relation to God. Few give thought to the suffering that sin has caused our Creator. All heaven suffered in Christ’s agony; but that suffering did not begin or end with His manifestation in humanity. The cross is a revelation to our dull senses of the pain that, from its very inception, sin has brought to the heart of God. Every departure from the right, every deed of cruelty, every failure of humanity to reach His ideal, brings grief to Him. (p. 263). Perhaps even more fascinating, for the 1893 General Conference, she had these words delivered to the attendees (she was living in Australia at the time), betraying just how burdened she was by the topic. Almost uneasy about putting it in these terms, she nevertheless wrote, “All heaven, if I may use the expression, is impatiently waiting for men to co-operate with the divine agencies in working for the salvation of souls” (General Conference Daily Bulletin, January 28, 1893, emphasis added). And it’s no wonder: the angels, who love their God, long to see His pain, frustration, and agony cease. They’ve watched Him for the last 6000 years agonize over the sin that Has infected this universe. They’ve seen the rebellion of Lucifer, the fall of Adam and Eve. They’ve seen the genocide, the holocaust, the atrocities of war. Most significantly, they’ve seen the cross as the culmination of the sin project, heart-broken over the pain that has pierced the heart of Him whom they adore. And, like Peter, I’m sure they are tempted to pick up their swords and fight if it could somehow hasten the obliteration of the pain in the heart of their God. What if we, as Adventists, somehow recaptured the Adventist vision of Christ’s soon return? It starts, of course, with encountering the love of that Christ as seen on Calvary. When we go to the cross and see the logical conclusion to what our present existence produces – death to God Himself – it will stir our hearts to the point that we will want to do all we can to hasten the end of God’s misery and woe. In other words, encountering Christ’s First Coming in all its beauty, depth, and agony will propel us forward to do all we can to usher in His Second Coming. So let’s go to the cross, you and I, so that Christ might soon come to us. (If you’re at all interested in reading more extended thoughts on this topic, you may want to check out my first book, Waiting at the Altar. Or if you simply want further inspiration, check out a song that always inspires and reorients me. It’s William Miller’s words after the Great Disappointment set to music, sung by Reggie Smith and accompanied by a choir with which I used to sing [Andrews University Singers]). 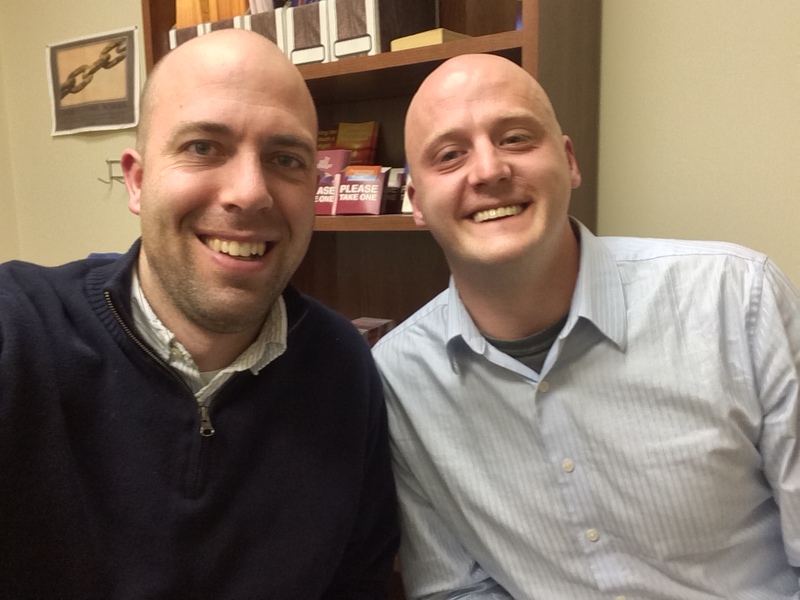 I’m inspired by James every time I talk with him – and it’s not just because he is bald like me. Through a series of very unexpected and somewhat unfortunate events, he started coming to our church about ten months ago. For the last four months or so we’ve been studying the Bible together. And I’m quite sure he drew the short end of the stick. There is no way – absolutely no way – that he is learning half as much, or being half as blessed, as I am by our time together. So in that regard, I feel sorry for him. But let me tell you about him: James used to be a drug-dealer in Bangor. Everything he did was to satiate his addiction to drugs and alcohol. Life was only about himself. Then something happened. He was arrested and found himself in jail. That was all it took. “Going to jail was the best thing that ever happened to me,” he told me last night. It was right there, in a little cell in Bangor, Maine, where he hit rock bottom. He realized his life needed to change. He realized he needed to be freed. That one night in jail is all it took. For the next six months, as he lived in a homeless shelter, he did a hard detox – which he said was actually pretty easy compared to getting over the real root of his addictions. Getting rid of the emotional and psychological demons was another thing altogether. It took going to AA and joining up with other support groups to help him deal with those demons. And then one night it happened, like someone turned a light on. He decided to stay in a hotel room for a week in an attempt to finally break free from the addictions. As he sat in that lonely hotel room, reading his AA book, something clicked: his past was his past. It didn’t need to be his present. He didn’t have to hang on to it anymore. He didn’t have to carry the weight of his history anymore. Since his past didn’t need to be his present, he didn’t need to medicate himself in the present anymore in order to drown out the cries of his past. And with the weight of his past off his shoulders, it was as though someone turned a light switch on and deleted his craving for drugs and alcohol. It no longer enslaved him. His taste for it was gone, never to return. He has been clean ever since. As awesome as this is, though, what inspires me even more is his new craving to help deliver people from the life he onced lived. It’s an all-consuming passion of his. He now works at the homeless shelter that once housed him as well as a soup kitchen. What excites him the most is traveling the streets of downtown Bangor in a canteen truck, setting up shop a couple times a month and bringing food directly to the demographic that he used to be a part of. I’ve been with him on this mission and his compassion and excitement for these people are contagious. James is normally a pretty quiet guy, but when he gets with these people and hands them chilli or a sandwich, he lights right up. He cares for them, invests in them, wants to help them live a better life. Whether fully understood or not, James knows – and more importantly, lives – the Gospel. And his burden to reach the down-and-outers of Bangor – a city that, though fairly small, has big-city problems with lots of drugs and homelessness – inspires me to be a better person and a better pastor. And I can’t help but wonder how many Jameses there are in Bangor and in the world who are one night in jail away from finally being free. Will we be there to point them to the One who can bring freedom? James’s story reminds me of something I read just yesterday from another “AA” book – Acts of the Apostles – which I have just started reading again: “The church,” Ellen White writes, “is the theater of [God’s] grace, in which He delights to reveal His power to transform hearts” (p. 12). What a thought! And what a reflection of James’s story. He’s been transformed – and now he wants nothing more than to be a conduit through which God’s grace can transform others’ hearts.